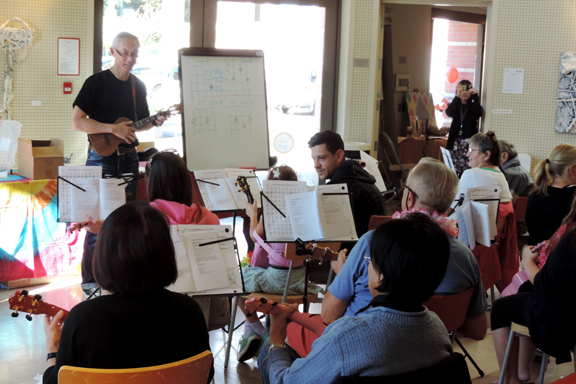 For the fifth year in a row, Cutie Circle volunteers (aka Cuties) will once again be offering aspiring adult ukulele players a free ukulele workshop series on Saturday afternoons. Intended for absolute beginners with little to no background in music, this workshop will give participants some basic knowledge to begin a journey into music using the happiest instrument on earth from April 6 to June 8. It was a fantastic experience for attendees and volunteers alike and we can hardly wait to meet everyone and spread the joy of ukulele this spring. Many of our students have gone on to share music by volunteering their time to perform at municipal and regional events and/or to teach ukulele to other seniors and children in the community. 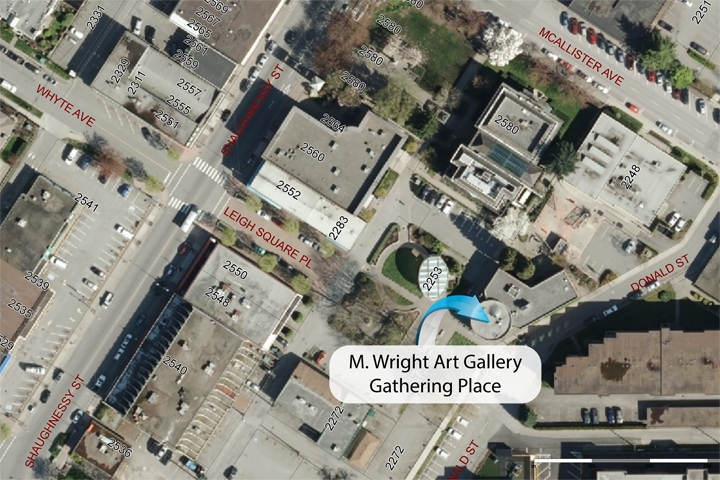 We thank the City of Port Coquitlam for offering the beautiful Michael Wright Art Gallery at Leigh Square for this workshop free of charge. Pre-registration is required. Registration form is located on the bottom of this page. We have acquired a few sets of ukuleles, music stands, digital tuners and textbooks (with our personal funds) for loaning to participants who do not own any equipment, upon receipt of a refundable deposit of $60. Please do not mark in (and/or damage) the loaner textbooks (otherwise the deposit will be forfeited). Participants can reserve a set when they register using the form below. We are in the process of establishing a small scholarship for a few keen students who might otherwise not be able to afford to buy their own ukuleles to continue their music journey upon conclusion of our ukulele workshop series. Those who would like to donate any ukulele in good condition (new or used) to this scholarship program are welcome to contact us. We will put you and the recipient in touch. As some of you have asked about the availability of ukuleles in the region, we have made some inquiries at local stores. Empire Music has a selection of ukuleles available via its website. For pick-up orders only (with a 24-hour advance notice because the company is a warehouse not a store-front), our students can pick up their orders in person to save on shipping. Empire Music has generously offered us a discount on the ukuleles we purchased for this workshop. Disclosure: We do not receive commission from any of these merchants. They are mentioned here as a service to the participants only. Cutie Circle and Terry Fox Library collaborated in the Fall of 2016 to create the Uke ‘n Play ukulele public lending collection. The Cutie Circle, Empire Music, King’s Music, Ohana Music and our good friend, Linda Thiessen, collectively donated 50 ukulele kits (including ukuleles, gig bags and tuners) and the FVRL rounded out the collection with ukulele instruction books and plastic containers for each kit. Library patrons of the 25 FVRL branches (from Port Coquitlam to Boston Bar) can now borrow ukuleles for free. In fact, InterLink Library network cardholders in the surrounding region (e.g., Metro Vancouver and the Fraser Valley) can borrow ukuleles in person at FVRL locations as well. A further 20 ukulele kits were donated to FVRL in the Fall of 2017 by King’s Music and the Cutie Circle. The Workshop Series will be held on April 6, 13, 27; May 4, 25; Jun 1, 8. Online registration opens on March 15. Registration confirmation will be sent to email addresses supplied via the form below. We look forward to meeting you at the workshop. The workshop series is geared towards adult learners and is unsuitable for young children and unaccompanied minors due to the length of each 2-hour session and the pedagogy employed. Adult participants who would like to bring along minors must supervise and assist their children at all times during the workshop. As seats are limited, we kindly ask that all who register for this workshop commit to attending all sessions. Participants with full attendance will receive a Certificate of Completion for the workshop. Registration is required for all participants (including accompanied minors). To assist us in our lesson planning, please let us know briefly your music background. For volunteers who are registering to help with the workshop, please indicate availability in the “Questions / Comments” box. I have the entire package. This entry was posted in Events, Posts and tagged absolute beginners, ウクレレ, 烏克麗麗, 高貴林, Free Ukulele Tutorials, 우쿨렐레, Leigh Square, Michael Wright Art Gallery, Port Coquitlam, ukelele, Ukulele, Workshop, 尤克里里, 乌克丽丽 on March 15, 2019 by cutiecircle. Cuties are ready to celebrate Canada Day on July 1 with ukulele players of all ages at the City of Coquitlam’s big birthday bash! 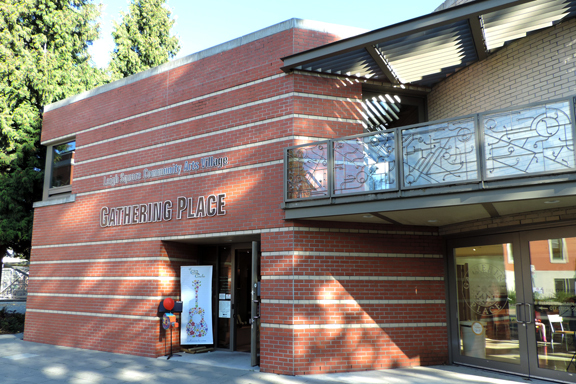 Join us between noon and 6pm for some singing and strumming! We thank the City of Coquitlam for hosting this family friendly event once again! For the first time, Cuties will attempt to build a ukulele float to partake in the Coquitlam Celebrates Canada Day Parade this year! Come help us decorate our float. Assemble at 11:40 a.m. at the gravel lot adjacent to the tennis courts. The procession starts at 12 noon. Our outdoor ukulele jam starts at 1pm. Bring your songbooks, a chair and your music stand. Come with a song to perform! Meet new friends and sing your heart out on Canada Day! We will be giving free ukulele lessons from noon to 6pm to all guests wanting to try their hands at a fun and happy instrument. Students earn certificates for participating in the ukulele lessons! Come also for some mini ukulele bumper stickers and the multi-colour ukulele hand stamps, too! Learn to play “O Canada” on the ukulele with us! Our booth will be located on the Community Drive. Look for the tent with lots of ukuleles, flower leis, music stands and happy smiles! See the map below for the Community drive where our tent is located. Limited parking will be available. We encourage you to walk, bike, carpool or take transit to the event site. A free bike valet (11:30 a.m. – 11 p.m.) will be available to keep your bike safe and secure during the day. 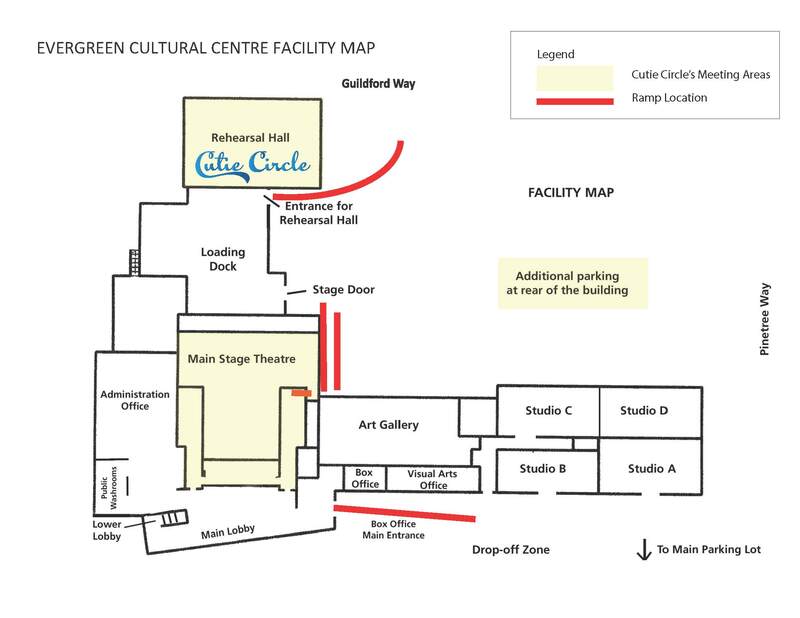 Check out the site map for location. 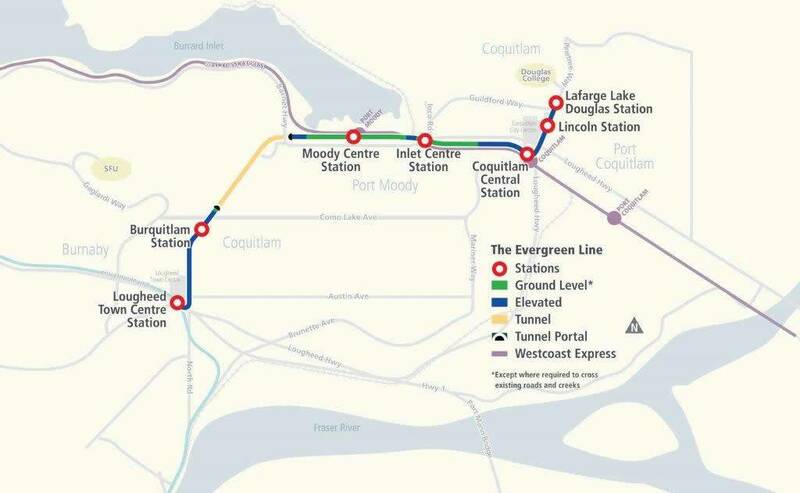 CloseRide the SkyTrain to the Lafarge Lake-Douglas station, it’s located right beside Town Centre Park and is a short walk from the event site. A free shuttle bus will run from 11:30 a.m. to 11:30 p.m. between Town Centre Park and Glen Eagle Secondary School. View the parking map for a list of free public parking in the area. This entry was posted in Blog, Events, Posts and tagged ウクレレ, Birthday Bash, Canada 150, Canada Day, Celebration, Community Drive, Coquitlam, Coquitlam Town Centre Park, 烏克麗麗, 高貴林, Free Ukulele Tutorials, 우쿨렐레, Jam, ukelele, Ukulele, 尤克里里, 乌克丽丽 on June 26, 2018 by cutiecircle. For the fourth year in a row, Cutie Circle volunteers (aka Cuties) will once again be offering aspiring adult ukulele players a free ukulele workshop series on Saturday afternoons. Intended for absolute beginners with little to no background in music, this workshop will give participants some basic knowledge to begin a journey into music using the happiest instrument on earth from April 14 to June 9. The Workshop Series will be held on April 14, 21, 28; May 5, 26; Jun 2, 9. Online registration is now full. To be added to the waiting list, please complete the form below. As seats are limited, we kindly ask that all who register for this workshop commit to attending all sessions. Participants with full attendance will receive a Certificate of Completion for the workshop. Registration is required for all participants. This entry was posted in Events, Posts and tagged absolute beginners, ウクレレ, 烏克麗麗, 高貴林, Free Ukulele Tutorials, 우쿨렐레, Leigh Square, Michael Wright Art Gallery, Port Coquitlam, ukelele, Ukulele, Workshop, 尤克里里, 乌克丽丽 on March 15, 2018 by cutiecircle.